I thought I'd post some changes that have happened in the store. We've added a new One of a Kind Snowflakes listing in the store. These are special skeins of yarn, where either the color didn't come out quite right or was an experiment that wasn't repeatable, or something like that. There are not pictures of these skeins so they're marked down to move. We may put a written description, and you can always make requests. Feeling adventurous? Want a great deal? This is for you. And we've been running a Colorway of the Month for the past few months which is working out quite well. We post a color on the first of the month, you place an order for that color on ANY yarn or fiber that we have available, (at 20% off! ), and we'll dye it and ship it to you by the end of the month. This is a great way to get yarns on bases we don't normally stock in the store. 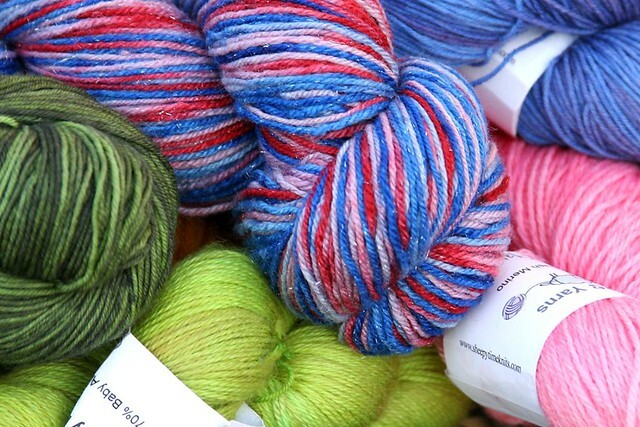 We have a lot of great bases in everything from 100% silk laceweight to Alpaca DK weight, to Worsted and Bulky wool. Colorway of the Month details here. And lastly we've been updating the web site. We've got several new pages, including history pages for Speshul Snowflakes and Time Traveler's clubs, if you want to see what there's been. The Yarns page is updated, and now includes pictures of all of our standard colorways, and info on all the yarns we typically stock. All pattern sales are now through Ravelry, whether you buy them from our site or directly from Ravelry. If you have any suggestions for the site now is a great time to make them, while we're making improvements. Come talk in the STK Ravelry group, comment on the blog, or send me an email.